Posted October 24, 2018 by Jamie Apps & filed under Arts & Entertainment, Events. Winners in the inaugural Companion Animal Rescue Awards were announced on October 12 in Melbourne. A field of 517 entries from around the country competed across seven categories honouring the work of organisations and individuals in helping to rehabilitate and re-home rescue animals. Sydney’s Cat Protection Society (CPS) proudly received the award for Community Education and Outreach Program for their Good Neighbour Project. It’s timely recognition in this, their 60th year as an organisation dedicated to the safety, care and happiness of Sydney’s feline community. The Good Neighbour Project is aimed at providing cat owners with practical information and resources to help their purr-babies live healthily and in harmony with their environment. 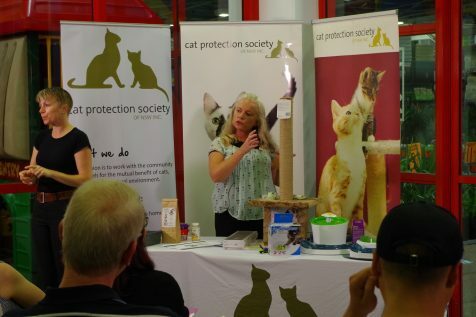 The brochure gives a brief summary of things to consider with suggestions for more information, and the Cat Protection Society website is an invaluable resource, with lots of ready facts as well as links to videos, articles, regulatory documents, listings and a whole lot more. The CPS is thrilled to be among the first recipients of the newly established awards and they see it as a great opportunity to further spread the message about responsible cat ownership.